As a writer seeking to better myself, I follow Kristen Lamb’s blog. She’s given some incredible advice over the years, much of it entirely for free! But every so often, some of her posts reach far beyond just writing and author advice. Her latest post, Why I Hate “The Giving Tree”–But How This Story Makes Us Better Writers, is one of these. Now, I had to google “The Giving Tree” and reread it again before I could remember what it was about, and it never actually had an impact when I read it. I guess because it didn’t have magic or animals in it (then, as now, I was very partial to a particular kind of books). Reading it now, I think it’s rather brilliant. Not that I necessarily like it, but I do admire it. But enough of my thoughts, it was Kristen’s that impressed me. “I honestly believe that stories we gravitate to as children says a lot about our fundamental nature, our strengths and weaknesses. I always loved the parable of the Tortoise and the Hare, namely because one of my strongest traits is my persistence. I loved the parable of The Crow and the Pitcher because I was always good at finding clever ways to solve seemingly impossible problems. The stories I loved possibly reflected back personality qualities that even at a very young age, I possessed and was even proud of. But then there was my dark side, a side I noticed even by the tender age of four when I was sounding out the words And the tree was happy. My tendency to people please (Old Man Whickutt’s Donkey) and my seeming inability to set a boundary with those who would take and take until I had nothing left to give (The Giving Tree) and me happily enabling my own self-destruction. The anger I felt toward the tree being a fledgling anger I felt for myself. Why did the boy feel the need to take all the apples? All her branches? Why couldn’t he just take some? Why did the tree feel the need to offer all her apples and all her branches? Couldn’t he see he was killing her? Did he even care? When it came to her trunk? Why didn’t she tell him to just go pound sand? “Our culture is guilty (my POV) of assuming that every child’s story is to serve as a role model. Don’t bully. Be a good friend. This is what happens when you learn to share. But literature serves a higher purpose. Isn’t the point of being a parent to rear a fully developed person more than simply being an activities director? That we are charged with rearing a grownup with fully developed empathy and a sense of injustice? Doesn’t it say something when a child reads a story like this and is incensed at the injustice of it all? The children’s movie Inside Out explored how dysfunctional we have become regarding human emotion. We aren’t permitted to be angry, sad, disappointed, jaded or hurt. We can be depressed (because there is a pill for that). Yet these “negative” emotions serve a purpose. It is okay to be angry and sometimes it is downright warranted. It is all right to be afraid. Our culture has become obsessed with never being offended and yet being offended is vital. There are things that should offend us. That is when real change is possible. Insulating entire generations from ever experiencing negative emotions is in a word? Psychotic. Silverstein didn’t believe in happy endings being a necessity. He felt that set children up for failure, that things didn’t always work out. That if every book had an HEA then children would wonder what was so wrong with them. They didn’t always get an HEA in their lives. What were they doing wrong? Nothing, my Wee One. It is life. Fair is a weather condition. Good stories also serve as catharsis. We need to watch comedy because we do need to laugh, but you know what? Sometimes what we need is a good cry, too. And maybe we aren’t yet “evolved” enough to cry over what is going wrong in our own lives, but we can cry for a beautiful tree that was rendered a stump. Now I’m a real sucker for my happily-ever-after, but even I agree with Kristen. What are your thoughts, readers? Did you remember this story? How do you interpret it? Do you agree with Kristen about the bad side of only giving children their happily-ever-afters? By the way, if you’re a writer, definitely subscribe to Kristen’s blog! Don’t believe me? Go here. Type in any sentence that comes to mind, nonsensical or otherwise. Then hit search, and the library will show you where in its “pages” these words reside. I tried, “how do you spell that melon cantaloupe, cantalope kantaloop” and it found that no problem. I tried a line from my WIP novel: no problem. You’ll get the same result. VSauce explains the logistics behind it (math), but it does raise some interesting questions. VSauce asks, “Did you really invent that thing if it already existed?” Does the fact that what you said came into existence when the library was created undermine your “invention,” or is it more important that it had meaning when you said it, rather than being a product of an algorithm? VSauce frequently asks interesting questions, and I recommend checking out other videos of his too. What do you think, readers? What sentence did you make up to test out the library? What if mind reading were real? In TV, movies, and books, when a telepath reads someone’s mind, it’s typically depicted as hearing words. Also typically, these words form complete sentences and ideas. But really, who thinks like that? First of all, do we really think in words all the time? I don’t think we do. At least, I’m pretty sure that I don’t. Sometimes I think in pictures, or concepts. When you think of your mother, do you see or hear the word “mother” inside your head, or do you generate a picture and/or the feelings and memories of that person in your mind? I would go so far as to say we never think only with words. There are always emotions and memories (and sometimes sights/sounds/etc) attached to what we’re thinking. So theoretically, if someone could read minds, how much would they be able to “read”? Would they only hear words, or would they sense concepts and pictures and feelings and everything else that go with thoughts? 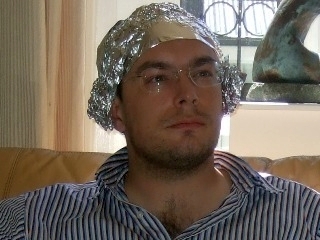 Tin foil will keep you from stealing my brain-thoughts! Well, you get the picture. And remember, I’m being forced by the medium to use words, which is already clarifying these thoughts far further than they may have occurred inside my head. My point is, if someone could actually read minds, would they actually be able to understand anything? Or would it all be too muddled or fleeting or self-involved or abstract to truly comprehend? It’s something to think about (if you’re so inclined). What do you think, readers? Is mind-reading even possibly coherent even if it could happen in physical practice? Am I over-complicating things? Or do you think most people are a little less ADHD than I am? Share your thoughts! My taste in humor isn’t always the same as everyone else’s. So much humor on TV (and elsewhere) just seems cruel to me. A comedian will say something “funny,” and I’ll be dumbfounded when people laugh, because I just found saw it as hurtful (not necessarily hurtful to me, but to someone). Cruel humor is everywhere these days. But when I saw this video, I thought, hey, here’s someone who has the right idea. It’s not about getting, it’s about giving. And it’s not just in comedy. What do you think, readers? Do you find much of today’s humor to be more cruel than funny? Do you like humor that gives better? What do you blog about when you’re too tired to think straight? I have been tired all week. Thankfully, I pre-wrote last week’s posts. But now this week is here. …Oi. I wonder where that saying came from, to “think straight.” I mean, yes, logical progression does seem, metaphorically speaking, to be more straight than crooked. Is that was it means though? Logical thinking? It seems to refer to something broader than that, to me. What about when you “think outside the box?” Are you still thinking “straight” when you think outside the box? Thinking outside the box is often applauded, after all, just like thinking straight. Maybe there are advantages to not thinking straight. What would it look like if we thought in zig-zags? Would it be creative? Nonsensical? Just plain loony? What about in circles? That seems negative, as one would never get anywhere. Like circular logic, which is argued to be self-defeating or even nonsensical in and of itself. This post is not intended to be inspirational (just in case someone thought it would be). This is about those stupid little things that you are “good” at. So I ask, what’s your superpower? Mine? Probably being cold. That’s right, my superpower is being cold. I can be cold when no one else in the room is cold. I can be cold when everyone else in the room is hot. I’m really good at being cold. Ergo, superpower. I never said it was a good superpower. My fingers and these icicles are approximately the same temperature 90% of the time. 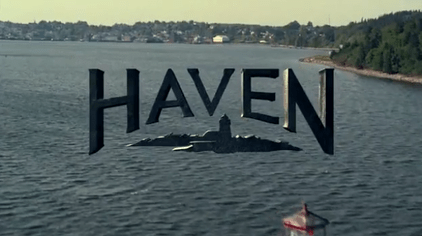 And at least I don’t have one of the awful “super powers” from the TV show Haven (a good show, btw). Haven: Home of the Worst. Superpowers. Ever. My boyfriend has a cool superpower though; he can move with uncanny silence. He isn’t trying to sneak up on people, but for some reason, we never see or hear him coming. He must have a ninja superpower (he denies this). How if I had a choice in my superpower, I would choose teleportation. Just saying. In case anyone out there is handing out legit superpowers. What about you, readers? What’s your superpower? What superpower do you wish you had? Dreams, Dreaming, Dead Flies and Bits of Fluff. Dreams. No one really knows why we dream, but everyone has an opinion. Do they mean something or are they just garbage our brain is trying to process and throw out? Honestly, I’ve always thought dreams are more like garbage. I rarely remember my dreams, and when I do, they’re incoherent and nonsensical. And yet… every so often I’ll have a dream that I find myself wanting to attribute meaning to. Friday night I had a dream that I packed a bunch of stuff into my Jeep (including my cat) and drove off. I wound up visiting some relatives on their farm as my first stop to driving across the US. Now where did that come from? I have a little turbulence in my life right now (some good, some less good), but I haven’t been giving holiday or travel (or even running away) any kind of thought lately. And yet the feeling of wanting to move, to just pick up and go, stuck with me powerfully for a few hours after waking up. I found myself wondering what it meant. Why do we do that? Why do we try to attribute meaning to dreams? As I mentioned before, most of my other dreams are “dead flies and bits of fluff,” garbage that my brain is filtering out and throwing away. And of course, not everyone shares my “garbage” view of dreams. Historically speaking, all kinds of meaning has been ascribed to dreams across all kinds of cultures (think oracles and prophets especially). Is this just a sign of human beings desperately trying to make sense of the world around us? What do you think, readers? Have you had any (or many) dreams that you’ve sought or found meaning in? Do you think dreams are meaningful? Share your thoughts! Here’s a beautiful and thought-provoking video. The style of dance displayed isn’t usually my thing, but I can still appreciate the skill, strength, and trust that goes into such a performance. And the monologue over top is interesting. I almost thought it was going to be a funny video (just for a moment) because the narrator sounds like the guy who does “Dear Kitten” and “A Cat’s Guide To Taking Care Of Your Human.” Instead it was worth watching, not for entertainment value, but for the value it brings in getting us to think about what trust is to us – perhaps even who we trust. So did the video make you think about trust? Or did you just watch the cat videos? ;) I promise I won’t judge. Has The World Become Too Loud? The other day, my boyfriend and I went for a drive. We left town and went up some logging roads. There were still people up there – it was a gorgeous Sunday afternoon – but we were more than far enough away that it felt like we were in the middle of nowhere. Living in a city, you never experience quiet. Not ever. There’s the distant rush of traffic, the hum of electronics, the chatter of people, the omnipresent wall of white noise. But have you noticed that there’s even more noise than ever? It’s like we’re trying to drown out the noise with more noise. Everywhere you go, there’s always music playing or advertisements blaring. Every store and restaurant has its own choice blasting away. When you go the mall and stand in the entrance of store, you can hear both at once: the hall music AND the store music. Day in, day out, we are inundated with noise. Noise keeps us from thinking. Think about that. Is it true? Does noise damage our ability to concentrate, focus, and really think? Would people think more if there were less noise? Or is it something else? I read a study that suggested that people hate doing nothing; do people hate thinking too, hate how stillness and silence encourage thought? Or are they altogether separate? I have a friend who is very bright, but I constantly see this friend make stupid choices. This friend will complain to me about the consequences of those choices, about how the choice was made in the moment, because it “felt” right, but no thought was put into it. This is the same friend who has music blaring constantly, who always has the TV on in the background (sometimes both at the same time), and who must always be talking or doing something. This friend of mine is smart – maybe even brilliant – but it’s like this friend never stops to think. How would this friend’s life differ if just a little more thought entered the equation? Smart people do stupid things all the time, and it’s mostly when they didn’t stop to think first and fully evaluate the consequences of their actions. It’s something to think about. Maybe try it. Get in a car and drive until there’s nothing but trees around. And think. Think about whatever crosses your mind. So what do you think, readers? Might there be something to this? Or am I just waxing lightly on a meaningless subject? Have you ever felt like our world has become too loud? Share your thoughts! Qualia: Philosophy and Did I Really Just See That? I guess some people might write off questions like this as frivolous, but I find them fascinating. This is the core of human curiosity. Questions like these are what birthed the sciences. Math, physics, chemistry, and most recently, psychology. How can questions like this be frivolous when they brought out every scientific revolution? So what about you, dear reader? Did you find the video interesting? Why do you think so many people think philosophy is boring?